Have you ever been on vacation only to return and find your favourite plant has died while you’ve been away? I have. It’s heartbreaking. I’ve since learned some tips and tricks for making sure that doesn’t happen again. 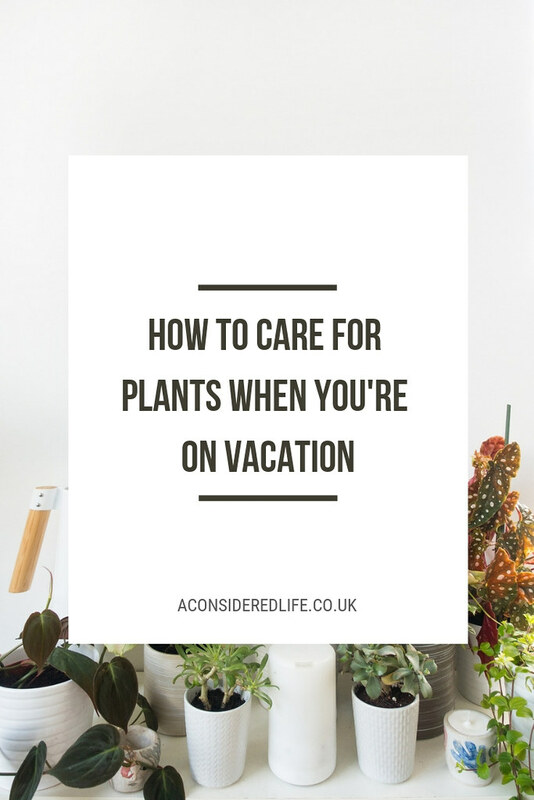 Investing a little time into prepping your houseplants before you leave for vacation can help you avoid coming home to leafless, withered, and possibly even dead plants. Going a few days without water is unlikely to kill your beloved plants so unless you’re on vacation for longer than a week, there’s really no urgency to find a houseplant babysitter to care for them while you’re gone. I have so many plants with different care requirements, it’s more hassle than it’s worth to explain to a bemused neighbour why you must water some and not others. I find it’s best to prep my plants before I leave instead of writing up complicated care instructions. Leaving a plant-loving friend in charge of watering might prevent casualties but not everyone is quite so green-fingered. These tips will show you how you can take care of your houseplants before you leave for your holiday to ensure your plants stay healthy while you’re gone. Spend some time with your plants. Check their planters, remove any dead leaves or flowers, dust them down, and give them a little health check. Check over leaves, stems, and the soil to make sure they’re bug, fly, and mite-free. If you notice any health issues, deal with them before you leave for your vacation otherwise you may return to find it’s spread to your other plants. I like to wipe down shelves, window sills, and plant pots too so they’re dust- and bug-free. Getting right up close to your plants helps keep them in good health, whether you’re going on vacation or not - it’s a good habit to get into. It’s also important to keep the temperature as stable as you can while you’re away. When you’re at home it’s a lot easier to notice when plants are getting too much or too little sunlight, and adjust as necessary. When you’re away that’s not possible and exposure to extreme temperatures or drafts can have a huge impact on the health of your plants. If there’s a windowsill that occasionally gets too much sunlight on a hot day or a shelf that leaves plants exposed to drafts, consider moving them to a more staple spot while you’re away. I move several of mine to the bathtub where I know they'll be happy while I'm gone. Right before you leave, ideally the night before, give all your plants a good watering. If you can, move them to the bath or shower so you can soak the soil and rinse the leaves, which helps flush fertiliser out and any bugs hiding in the leaves. Water until it drains out of the bottom of the planters and then leave them to stand to ensure the excess water has drained off. Not all plants like this treatment (like cacti and succulents), just make sure all the plants you’d usually water during the week are looked after. I tend to give all my plants a good watering and then cross my fingers and hope for the best. Houseplants are more resilient than we expect and more often than not they do just fine without us. If you’re on vacation for less than a week, most hardy plants won’t require another watering while you’re away. You can leave them happy in the knowledge they’ll survive without you. Other more fussy plants might require a bit more attention. For plants that like more frequent waterings, insert a watering wick or use self-watering planters. If you have plants that like boggy soil you can add mulch, wood chips, or bark mulch to help retain water. If you’re really concerned about your special houseplants, asking someone to water your plants while you’re away is the best option. 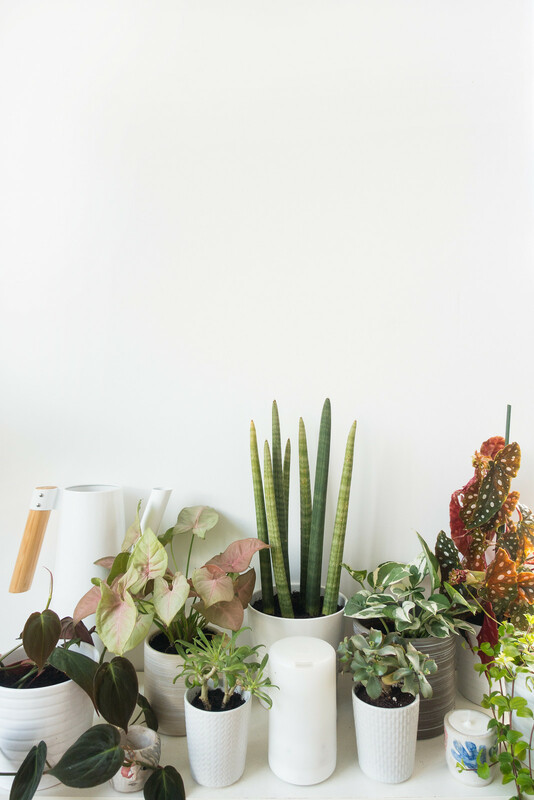 If you have any particularly fussy plants, ones that like to be turned frequently, moved in and out of the sunlight, or prefer frequent waterings, it’s best to find them a new spot to live in while you’re away. Think of it as a mini vacation for your houseplants. Even if you have to group the plants together, it’s better for them to be overcrowded in a temperature controlled spot than left exposed to too hot or too cold weather. If you have any plantlings, these can be more fragile than mature plants. Make sure they’re well watered and in a spot out of direct sunlight and they should be fine. My calathea is a drama queen, as is my syngonium. If I’m even a day late in watering them, they wilt dramatically. As soon as they’re watered they spring right back and so I’ve learned to give them a little extra care and attention. The best option for these dramatic plants is to move them into the bathroom or at least away from bright or direct sunlight into a shadier spot. 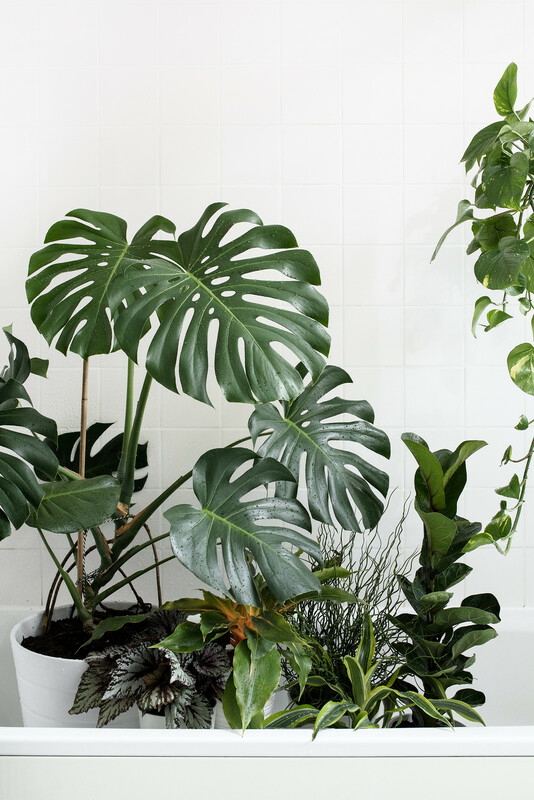 Grouping your plants together, especially in a bathroom, can raise humidity and bathrooms offer diffused light, which is a lot kinder to the more delicate houseplants. Putting your plants on pebble trays can also help raise the humidity, as can covering them. Makeshift terrariums can help plants thrive for up to two weeks so it’s a good option for longer vacations. Do you have any questions about taking care of your houseplants when you go away? Or any tips and tricks you could share?